Have you been camped out in front of the TV this weekend, watching the Olympics and cheering on Team Canada? From the silver in team figure skating to our Quebec sisters winning gold and silver in moguls, it's been loads of fun. My twitter stream has been going nuts all morning, especially when Canada won gold and silver in men's moguls. It's been an amazing day! 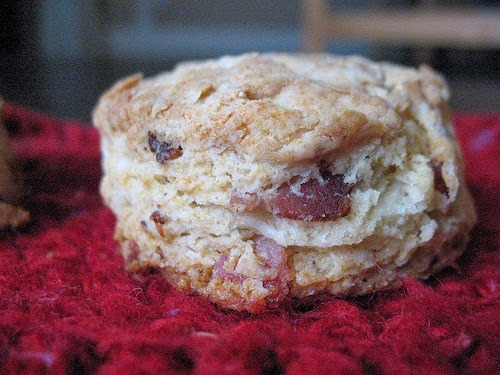 With Canada on the brain I couldn't help but make these maple bacon biscuits-a little sweet, a little salty, and super tasty to slather in butter and eat with soup. You may want to double this recipe just so you have enough! In a skillet, fry up the bacon until crisp. You could also cook it in the oven if you were making a bunch of bacon, which I find gives you a more evenly cooked result. Save 2 tbsp of the fat from the bacon. If you're cooking the bacon in a skillet, you may not get quite this much and have to top it up with butter. Put the liquid bacon fat in a small dish and set in the freezer so that it solidifies. In a medium sized bowl, stir together the flour, baking powder, baking soda, and salt with a fork. Set aside. Chop up the cooled bacon and stir with the maple syrup. Set aside. Using a pastry cutter, cut in the solidified bacon fat and the butter into the flour mixture until the mixture resembles coarse crumbs. Stir in the maple syrup/bacon mixture and the buttermilk with a fork until the mixture comes together in a slightly sticky dough. Turn out onto a counter and knead once or twice. Pat into about 1 inch thickness before cutting into six or seven biscuits with a 2 inch cutter. Place the biscuits on a parchment lined baking sheet, sprinkle the tops with a bit of maple sugar, and bake them for 8-12 minutes. They do tend to brown up more than other biscuits, I'm guessing from the bacon fat. Remove from the pan and let cool on a wire rack. Serve immediately. To make these ahead, you can place the uncooked biscuits on a tray and let them freeze until firm, then put them in a sealed bag. When you bake them, they can go straight from the freezer to the pan and you just need to add a few more minutes to the baking time.